Whose Hanging Bears Are These? 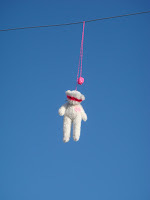 Many of us want to know who's been tossing these stuffed teddy bears up onto wires all over Los Angeles. With their bright plushy bodies and pastel pink eye masks, the bears have been seen the last couple of months hanging above Sunset Blvd., Hyperion Ave., and other major thoroughfares throughout and around LA , including in Silver Lake, Los Feliz and West Hollywood. Their Twitter followers say things like, "I see your bears everywhere!" And finally, in response to a direct Twitter question from yours truly, the response came simply with a link to the bear photo Tumblr. Case closed? Or hung jury?